Superior grade cast bronze with ebony shaded bands. 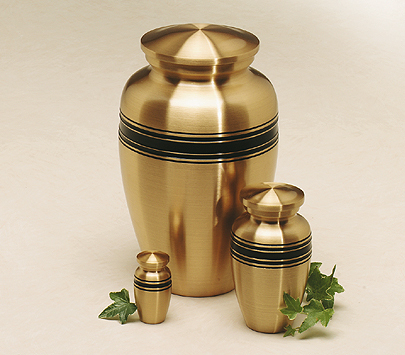 Urn surface is engravable at an additional charge. Also available in small (for cats) and keepsake sizes. Extra Large is located at rear of photo. Closure: Top-opening Threaded Lid Large, 6.125"Dia. x 10.375"H; 176 cu. in. Urn Weight: 12 lbs.